India along with ten countries of World Health Organization (WHO) South-East Asia Region has been certified Polio free by the Regional Polio Certification Commission on the 27th March 2014. 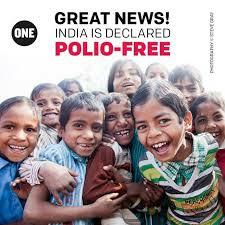 No laxity has been reported in the polio eradication program after the country was declared “Polio free country”. · Two rounds of high quality national immunization day (Pulse Polio) being conducted each year. · Sub national immunization (SNID) rounds being implemented in high risk states such as Uttar Pradesh, Bihar, Delhi and high risk population pockets in the states of Haryana, Punjab, Gujarat, Maharashtra, Rajasthan, Jharkhand, Uttarakhand and West Bengal. · More than 100 vaccination posts are functioning along the international borders of India with Nepal, Pakistan, Bangladesh, Myanmar and Bhutan to administer oral polio vaccine drops throughout the year to all children below five years entering India. · India has also made polio vaccination a mandatory requirement for travellers irrespective of age coming from and going to polio infected countries. · Certification standard surveillance for cases with acute flaccid paralysis is in place to detect importation or emergence of polio case. More than 50,000 AFP cases are being investigated annually across India. · Environmental surveillance through testing of sewage samples for polio is functioning strategically at Mumbai, Delhi, Bihar, West Bengal and Punjab. · State and District level task forces are in place and actively overseeing the implementation of polio immunization and surveillance activity. · The Ministry of Health and Family Welfare issued a press release on 20th June through Press Information Bureau to leading newspapers and news agencies. The press release informed the media that the 208 cases reported from Bareilly (Uttar Pradesh) were of acute flaccid paralysis (AFP) and the cases received from the laboratories in 2015 are negative for poliovirus. That stringent environmental surveillance is routinely undertaken to detect any polio cases. · In Uttar Pradesh, prompt action was taken by the Health Department in organizing a media briefing by the Chief Medical Officer and the District Immunization Officer. The media briefing was also attended by WHO-National Polio Surveillance Project (NPSP) and UNICEF Social Mobilization Net (SMNet). · Large scale media workshops in 38 districts reaching over 600 journalists have been undertaken in Bihar by UNICEF to sensitize journalists about the surveillance process, adverse events following immunization (AEFI) and educate them about the difference between polio and AFP cases. As a result of these workshops over 350 positive articles have been published from March – July 2015. The tonality of 92% stories on polio in Bihar is positive. The reported suspected polio cases across the country are subsequently discarded as Non-Polio Acute Flaccid Paralysis (NPAFP) cases based on symptoms and stool results. Apart from the measure taken as detailed in para (b) above, the NPAFP cases are also advised for follow up for further treatment in Hospital.